So my lime hand squeezer ( hinged two halves that squeeze together by hand) broke after couple years of service. Is it common for them to break in that time? Am I squeezing too hard? Is there a more durable one? Mine was made of some gray foamy metal, possibly plastic, and painted green. If I still have the pieces, I might post it. My cooking partner says it's my fault, and not shoddy craftsmanship. When it broke,I got cut, which is why I'm not just going to immediately replace it with whatever is at the store. Thoughts? I managed to finish the recipe before it broke, but I will need another in a week. Avoid aluminum and/or enameled squeezers, and make sure you get good quality stainless steel. I've had an enameled aluminum one that broke after a few uses. I don't know which one we have at home, some sort of metal, not plastic. We've been using it for several years. How much lime goodness am I missing by just using my hand? Enough to make it worth it to get a squeezer. Probably not much. I like these things because you don't have to strain seeds. That's not a big deal either - I often use my hand as a strainer and it works fairly well, but these are very easy and quick, especially if you're squeezing more than one lemon. 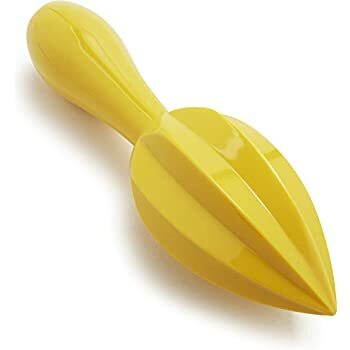 I personally use a Citrus reamer (despite the name), which works great for me, and I find gets more juice than one of the squeezers, which always seem to miss out on the pulp around the edges. Every squeezer I've found works for Persian limes, but is completely useless with key limes, which are too small to be effectively squeezed by the two-part squeezers. Equipment breaks, especially if you use it often. That’s just the way it goes. So maybe you did something that caused the juicer to break, maybe it was just old. Most of the two part ones cost under ten bucks, so a biannual replacement isn’t that big a deal. I use either a reamer, as pictured above, or an electric juicer, depending on volume of juice needed. Key limes as sold today are vile, evil little shits with about 1.5 teaspoons of not particularly exciting juice in them. I hate squeezing them so much that they don’t even try to make me do it at work. I really want to develop a small hydraulic press to crush the fuckers dry. You can find useable electric juicers at the goodwill or Sally Ann for under ten bucks, and I find them worth the cost. Thesh wrote: Avoid aluminum and/or enameled squeezers, and make sure you get good quality stainless steel. I've had an enameled aluminum one that broke after a few uses. Which one did you buy? Otherwise I'll amazon a random steel one that's 22$. There's no brand or model markings of any kind on mine; it's five years old, and I don't remember where I bought it. That is about as helpful as suggesting that Sardia use my hand. I was forced to respond to the question as phrased, and my opinion is that the random $22 stainless steel squeezer on Amazon that gets good reviews looks like it will last. Oh no doubt. I was not casting aspersions. Round here we only cast asparagus! You're generally right about most commercial key limes, the only time I will even buy them is if I'm at a big Mexican market, which I know has a good turnover rate on their limes, and only if they feel heavy and are between yellow and green in color. You can't make a key lime pie without them, Persian limes aren't acidic enough to curdle the condensed milk. Key limes have more oil in them too, so the zest is much more fragrant.